Description: Red sand is everywhere throughout the south, but rarely do you get the chance to see sand as interesting as it appears in Providence Canyon State Park in Georgia. 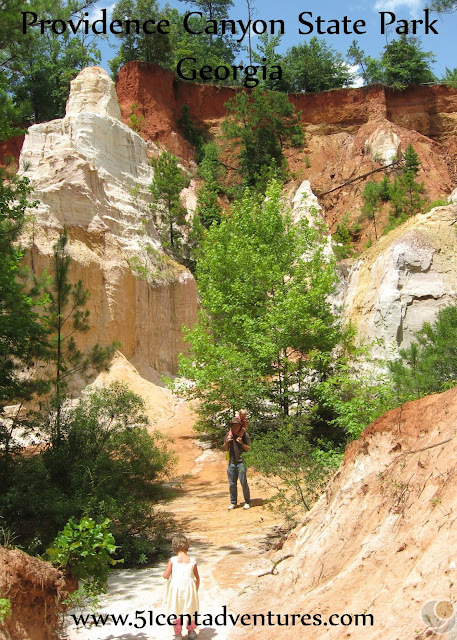 Here the sand has been eroded into beautiful canyons and cliffs. Water flows through the canyons allowing trees and other vegetation to grow. 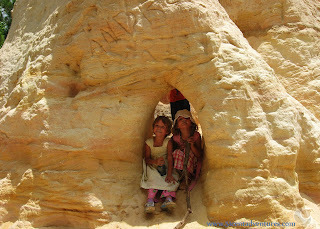 Perhaps the most interesting part of the park is the fact that the canyons were created less than 200 years ago through erosion from poor farming techniques. Operating Seasons and Hours: The park is open daily, generally from dawn to dusk. 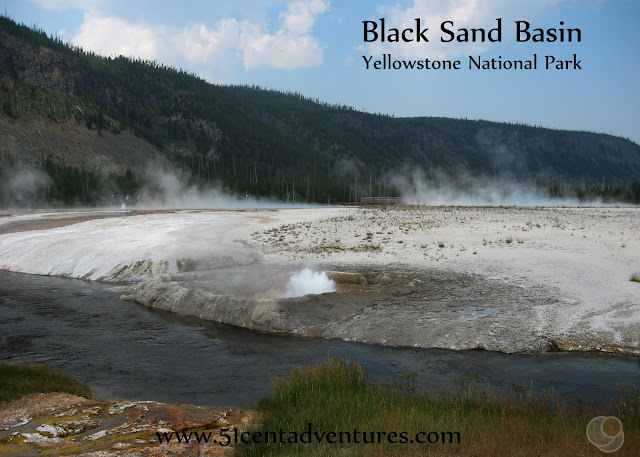 The Visitor Center is only open Friday, Saturday, and Sunday during the months of September, October, November, March, April, May, June, and the first week of July. Visitor Center hours are 8:00 am to 5:00 pm. Providence Canyon State Park in Georgia was one of the first places I ever talked about on this blog. Brandon and I visited the area in December of 2012 after he graduated from Basic Training at Fort Benning, Georgia. 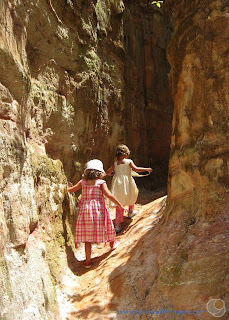 We had a fun afternoon exploring some of the man made canyons. At the time we thought we would never have a chance to see this part of the south again. As luck would have it we now live in Alabama-only 50 miles from the Georgia/Alabama border. 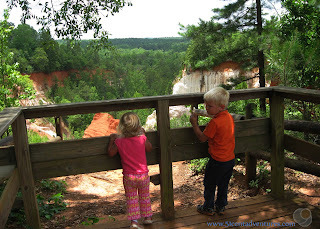 Brandon has wanted to take our kids to see Providence Canyon ever since we moved to Alabama. He estimated that the State Park was only about 45 minutes away. I was willing to bet it was a little further, but I still wanted to go see the canyon again. Last Saturday seemed like a good enough day to go for a drive up to Lumpkin, Georgia. Our kids were cranky so we hoped they would fall asleep while we drove. We figured they would be their usual happy selves when we arrived at the park. Unfortunately they didn't fall asleep. We made the mistake of turning on a movie in the car and their little eyes stayed glued on the screen for the whole two hour drive. So when we arrived at the park they were even more tired and cranky then they'd been at home. To make matters worse it was hot and humid outside. We tried to calm everyone down with food, but everyone was still pretty crabby. I took a picture of our picnic, but you don't get to see it because no one looks happy in it. I momentarily gave up on pictures of the family and took pictures of the canyon. You can't see into the canyon from the parking area. 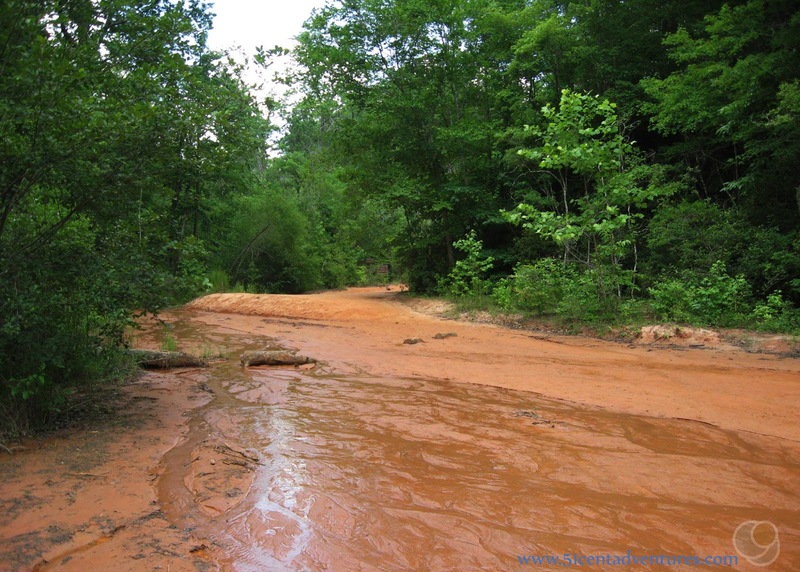 In fact, if you didn't know what this place looked like you'd probably think it was just like any other southern forest. As you get closer to the rim you can see into the canyon. From the rim you see a scene that is very impressive. I like this canyon because it reminds me of all the red rock canyons back in my home state of Utah. However, this canyon is very different from the ones in Utah. For one it is much much much younger. Providence Canyon State Park formed less than 150 years ago when poor farming practices caused the soil to start eroding. 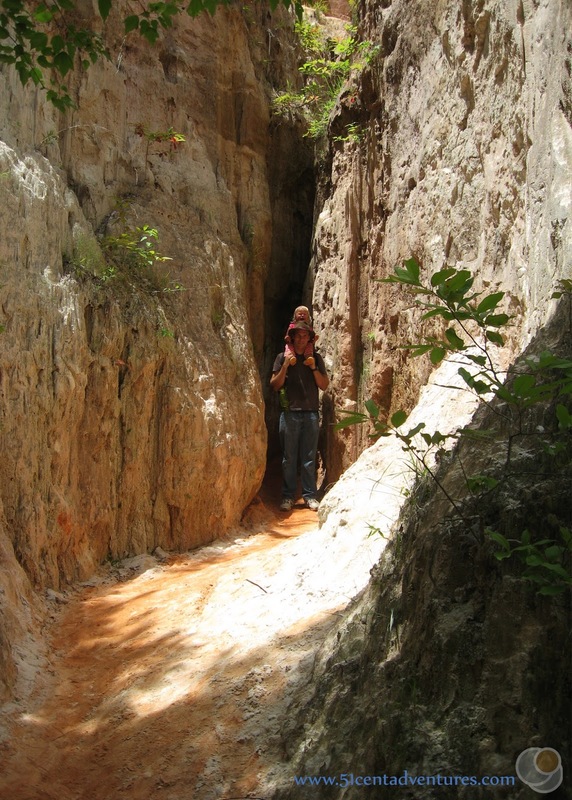 Shallow trenches turned into deep gullies within just a few years. It's eerie to stand on the edge of the canyon and realize that everything you see would have looked very different two centuries ago. 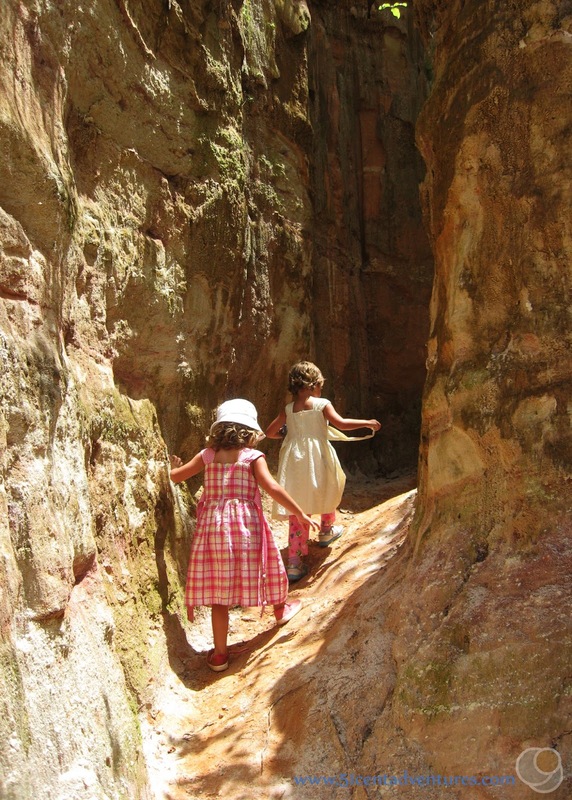 My twins weren't interested in looking into the canyon, but my son and daughter followed me over. They liked looking into the canyon. In hindsight we really should have waited for a weekend in the fall to take our kids to the canyon. I knew that Southern summer days are hot and humid, but I figured we'd stay in the shade so the heat wouldn't matter so much. But we weren't in the shade during out picnic. We were all hot and grumpy. Several times my husband and I had to use the "we'll just go home if you don't start behaving better right now" threat. It didn't really help. In the end we decided that the kids were already upset, and so taking them on a hike really couldn't get them more upset. So we drove over to the Visitor Center parking lot. The trail down into the canyon starts behind the visitor center and switches back once or twice before it reaches the canyon floor. When you reach the bottom you come to a stream which is actually the trail into the separate canyons. Our kids were all really excited to walk in the water. On our last visit my husband and I had explored canyons 1, 2, and 3. This time we decided to check out canyons 4 and 5. These are the same canyons that I saw from the overlook. This is what the walls of the canyon look like up close. 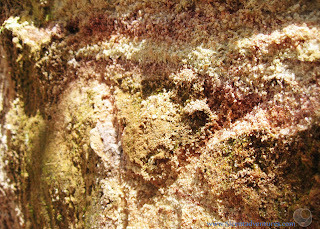 The walls aren't made of stone but rather very compact dirt that flakes away if you pick at it. Its easy to see why these canyons formed so quickly. I wish I could say that we all were a lot happier while we were hiking, but that wouldn't be true. It was even more humid in the canyon, and that didn't help our moods. One of my daughters found a stick and drug it thought the dirt the whole time. I just have to say that a four year old hiking with a large stick is pretty annoying. I don't know how many times someone either almost stepped on or was almost poked in the eye with that stick. Still the scenery made all the annoyances of teaching our kids about nature worth it. 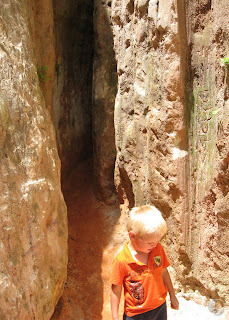 We had fun checking out some of the little features in the canyon. There was this cool little slot between canyon walls. I thought that the walls met behind that curve, but actually they widened up again into a little chamber. This is the view looking up from that chamber. Here is Brandon and our youngest daughter posing in front of the little slot canyon. This girl usually doesn't like to be carried much, but since she was so tired she insisted on being carried most of the time. There was another tiny slot canyon a little further up the main canyon. My 4 year old twins had fun climbing up to it. My girls are so funny. They love to wear dresses, but they also don't mind going on adventures. So they usually end up hiking in their fancy dresses. 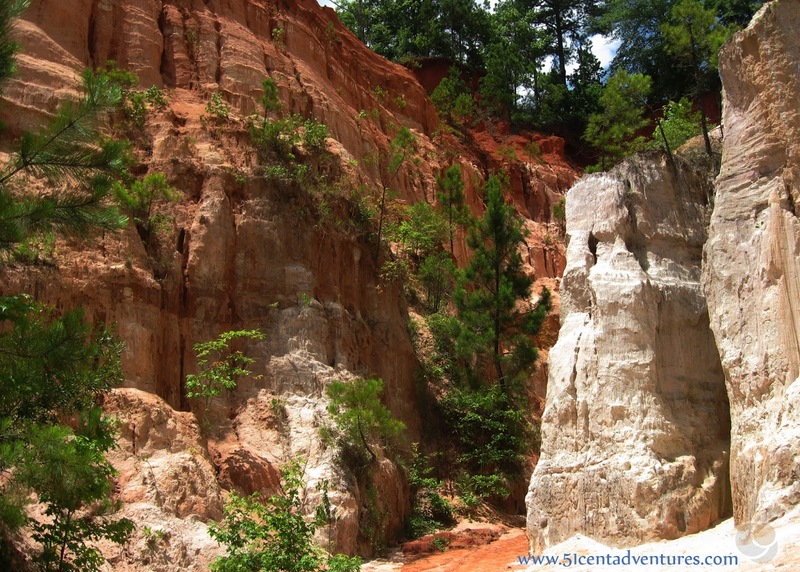 The main canyon ended with a sandy hill that was fun to climb. 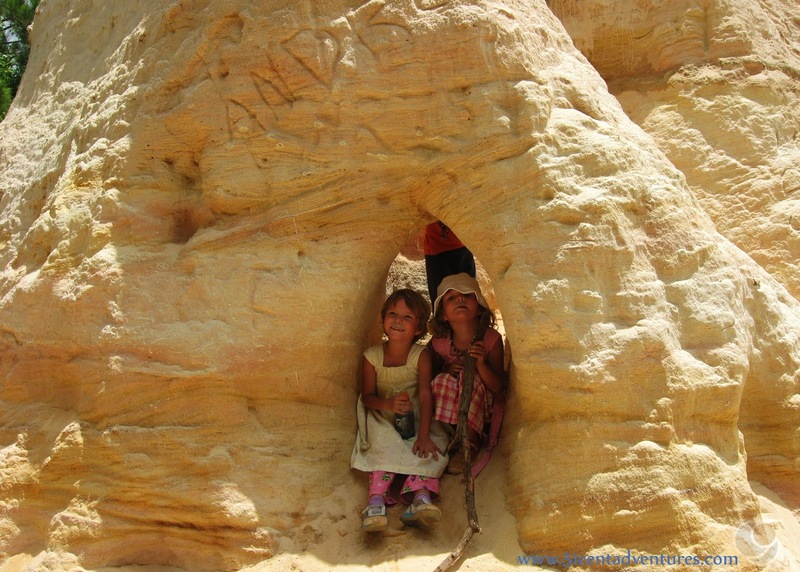 There was a little arch at the top of the sandy hill. 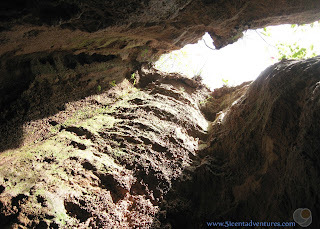 The kids had fun crawling under it. 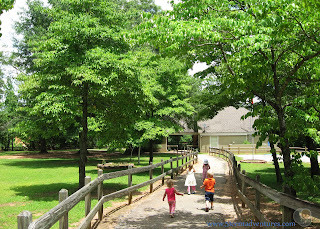 This area would have been a great play area if it had been about 20 degrees cooler outside. As it was it was about 90 degrees and humid. I just wanted to get back to the car - or at the very least to get back into some shade. Things improved on our walk back down the canyon when a cloud rolled in and covered the sun. Somehow just having the temperature drop a little bit improved my mood. 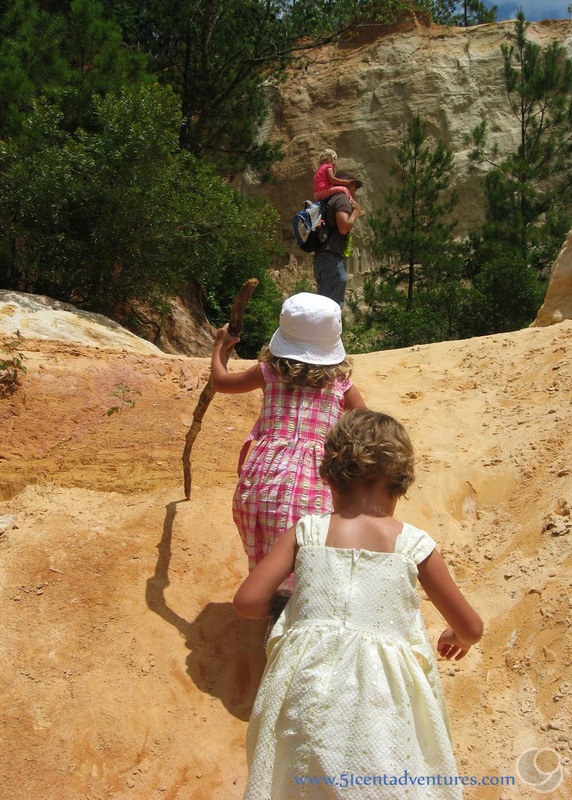 I had my worries about how the hike back up from the canyon would go, but the kids were surprisingly well behaved. We made it up the trail without any additional complaints. After that we all hurried to get in the car and enjoy the air conditioner again. Thankfully the kids fell asleep on our way back to Alabama. Recommendation: I still highly recommend this canyon to anyone in the South who wants to see some cool red rock formations. I do not recommend visiting this area in the summer months. In fact after this mis-adventure I turned to my husband and told him that we can't plan any more hikes until at least September. Next week we are going to the beach. Directions: Take Georgia Highway 27 south from Columbus or north from Eufaula to Lumpkin. Turn west on 39C. You will see the entrance to the park on your right after 7 miles. Turn onto Canyon Road at the entrance. There will be a place to pay your parking fee and to pick up a map. You can either park there or continue driving to the picnic area/canyon overlook. The Visitor Center is about a mile up the road at the north end of the park. 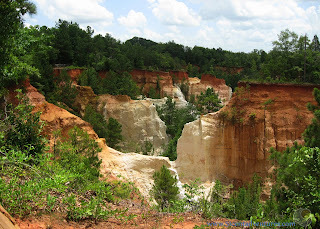 Places Nearby: On reason Brandon wanted to re-visit Providence Canyon was because he remembered our trip there when he passed it while on an Army training field trip to a Civil War Era POW camp. 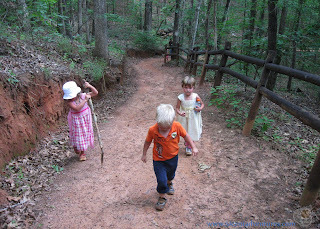 The Andersonville National Historic Site is located about an hour away from Providence Canyon. 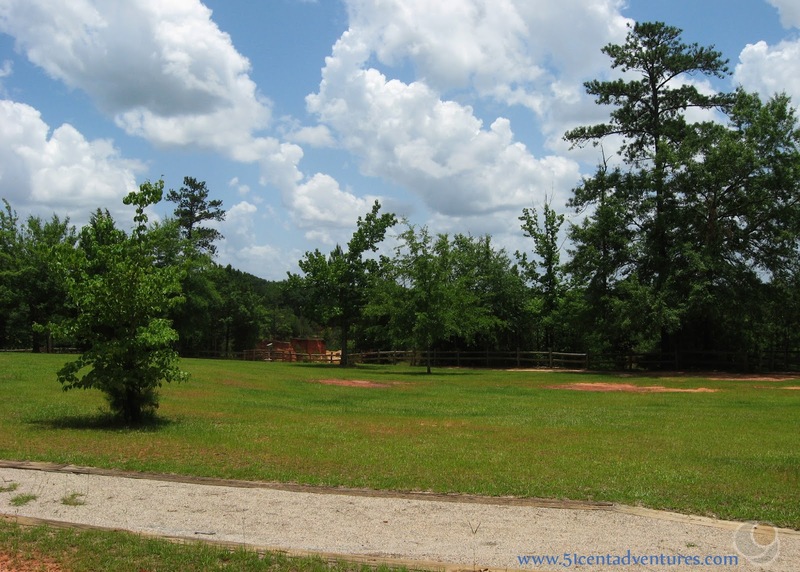 This is the location of one of the largest Confederate prisoner of war camps from the civil war. Brandon wants to take me and the kids to visit it one day.